CARACAS—The presidential election in Venezuela this Sunday really shouldn’t be this close. Counting on his legendary charisma and a dizzying oil boom that has brought nearly $1 trillion into state coffers during his tenure, Hugo Chávez probably thought he could coast to a third six-year term. But then, reality went off-script. The comfortable poll lead he’d held for most of the year vanished in the last ten days. As the campaign draws to an end, Sunday’s vote is best seen as a toss-up. What happened? At first blush, it’s mystifying. In an increasingly autocratic petrostate, the advantages of incumbency are so deep, it really ought to be a walk. Take access to the media. Three minutes per day per broadcast outlet. That’s how much advertising each candidate is allowed in Venezuela in the weeks leading up to a presidential election. That’s six thirty-second spots, no more. To long suffering TV watchers in U.S. battleground states, that must sound like paradise. There’s a catch, though. While each candidate’s campaign is allowed no more than 3-minutes, the government can run as many “institutional” ads as it wants to promote its work. And in Chávez-era Venezuela, such ads are generally indistinguishable from the official campaign ads, down to using designed-to-look-alike logos. But there’s more. Under decades-old legislation designed to allow the government to communicate during a national emergency, the president is legally empowered to comandeer the airwaves on every TV channel and every radio broadcaster simultaneously, whenever he wants, for as long as he wants. The government doesn’t have to pay for these so-called “cadena” (chain) broadcasts, or even give TV stations any advanced notice that one is coming and, as you probably guessed, cadenas are also often top-heavy with campaign themes. Such cadenas have taken up an average of 30 minutes per day since the official launch of the campaign on July 1. And that’s not all. In the last six years, the Chávez government has made it an explicit goal to achieve "communication and information hegemony", at once multiplying the number of state-owned media outlets and cracking down on critical broadcasters. Much of the state media is relentlessly propagandistic in the Soviet mold—just hour after hour of government boosterism and harsh, vitriolic attacks on the opposition. The remaining independent broadcasters, by contrast, are largely neutered: stepping on any of several never-clearly-spelled-out red lines can bring on heavy fines, serious harrassment or even a station closure. And so private news broadcasts are as anodyne as public ones are propagandistic. And yet, ask Venezuela’s elections authorities whether Sunday’s elections are taking place on an even playing field and they’ll smile beatifically and say “of course, each campaign can have 3 minutes of advertising on each broadcast outlet: totally equal!” This kind of barely-believable falsification of democratic normality is a key feature of the Chávez regime. It’s not quite democratic, but it is concerned with being seen as democratic. That concern does build in a certain space for contestation. It’s space that, however limited, opposition candidate Henrique Capriles has exploited masterfully. The 40-year old state governor has run a nearly flawless campaign: sidelining the opposition’s reactionary wing in favor of a much more moderate Social Democratic stance. Young, nimble and energetic, Capriles has spoken to working class Venezuelans in less urban parts of the country in their own language—certainly much more so than the more conservative leaders who led the opposition before him. Running on a record of achievement in his home state of Miranda, Capriles has capitalized on people’s growing day-to-day frustration with the dysfunctional chavista state, promising to keep its popular social programs while radically cracking down on the runaway waste, corruption and political sectarianism that hobble every chavista initiative. Why a single mom in the barrio dealing with constant power outages and water service interruptions, double-digit inflation and out of control crime is meant to care about universal equilibrium is never quite spelled out. Fourteen years on, he has little to say about “the concerns of people like you,” to use the hoary old polling cliché. Political power has clearly robbed him of his populist touch. 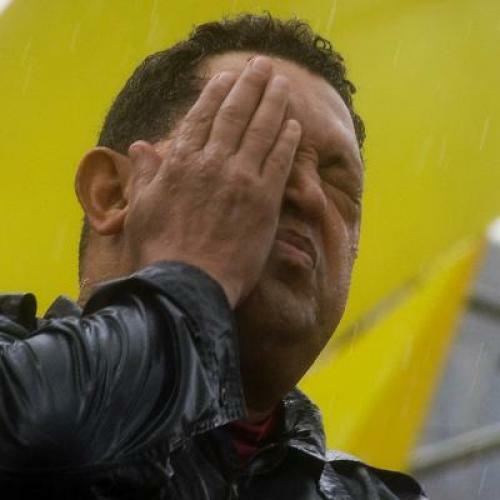 But the bigger problem for Chávez is that, while he remains personally well liked by most Venezuelans and fanatically adored by a not inconsiderable minority, even his most die-hard supporters realize his government stinks. The government Chávez has built is a monumental fiasco. Corrupt, bureaucratic, opaque and wedded to unworkable ideological certainties, the chavista state is top-heavy with cronies and arbitrageurs who talk about the beauty of socialism all morning and siphon off the profits of crooked deals into off-shore bank accounts all afternoon. Today, it amounts to a sprawling bureaucracy that simply doesn’t have the resources to make good on the ideological checks the president spends his days writing. The result is a paradox: to many Venezuelans, the emotional bond with the first leader that ever spoke directly to the barrio remains strong. But it coexists with a no-longer-concealed realization that he’s not particularly good at his job. Worse yet, he may not be around that much longer. An unspecified type of cancer that first struck him in the summer of 2011 recurred earlier this year. The President claims to be cured—but he sure doesn’t look cured. He lumbers around slowly and visibly bloated, reportedly a side-effect of the steroids administered to keep him in fighting shape through the campaign season. The contrast with the nimble Capriles, an amateur marathon runner nicknamed "Skinny", couldn’t be greater. How sick Chávez may be is impossible to say. But his bout with cancer inevitably put his supporters in mind of his mortality. Chávez has always been more popular than the government he leads, and Venezuelans intuit that the president may not be able to serve out another six year term. When the big guy is not around anymore, what will be left behind are the institutions he has created. As it turns out they, too, are bloated, lumbering beasts, stricken by corruption that’s metastasized out of all control . In a strange way, Capriles has positioned himself as Chávez’s heir more than his competitor, the one best positioned to straighten out the chavista state and make good on the promise of radical social reform Chávez promised, but that his bloated, corruption-ridden state could never deliver. And that’s why, despite the thousands of hours of chavista propaganda broadcasts, despite the petrobillions spent on populist giveaways, despite all of the crushing advantages of incumbency in an authoritarian petrostate, Henrique Capriles really does have a chance this Sunday. And that, in itself, is a remarkable achievement.